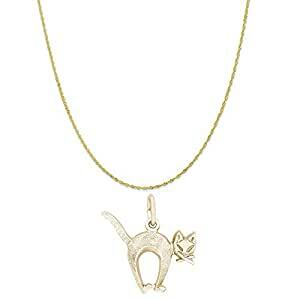 Rembrandt Charms 10K Yellow Gold Arched Cat Charm. This charm comes on a high quality 16, 18 or 20 inch box, rope or twist curb style chain depending on the version selected. Rembrandt Charms are timeless collectibles that capture memories, events, special occasions or emotions. Each charm tells a story. Rembrandt Charms has been designing and handcrafting charms in the United States for over 45 years.